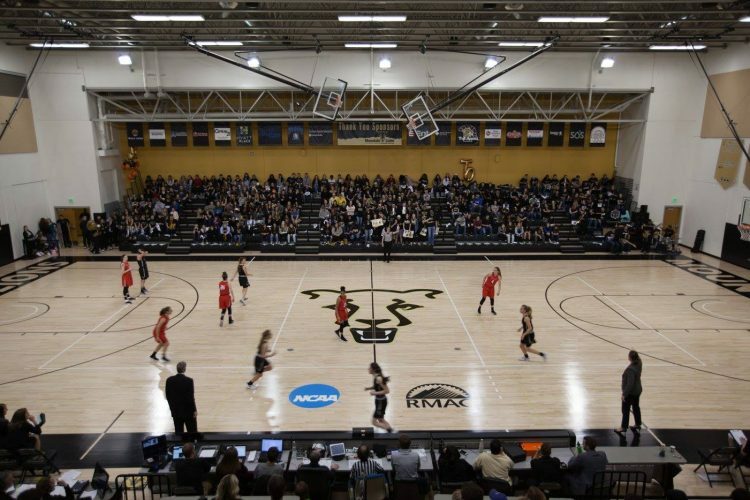 Fans pack Gallogly Events Center for Blackout Night Jan. 19, 2018. Photo by Savannah Waggoner. UCCS basketball will celebrate its annual Blackout Weekend with free t-shirts, student tailgate and the jersey retirement of the all-time leading scorer Feb. 8-9 at the Gallogly Events Center. Games begin both nights at 5:30 p.m. with the women’s games, followed by the men’s game at approximately 7:30 p.m. Athletics and Student Life will distribute 1,000 blackout night t-shirts to students before Friday’s game. Students can also attend a free tailgate starting at 4 p.m. in Berger Hall, with giveaways every 15 minutes, free spirit gear and food. A full meal will be available at halftime of the women’s game. Dining services for housing students will be available only in either Berger Hall or the Roaring Fork Dining Hall (The Lodge dining facility will close for the Blackout tailgate). Jane Dillon, the CU Advocate of the year, will be recognized at halftime of the women’s game. She was recognized by CU President Bruce Benson in fall 2018 during the Advocates celebration event. While not a UCCS or CU alumna, Dillon has donated to 18 campus scholarships and established a new endowment for the university. Alex Welsh, the men’s basketball all-time scoring leader, will have his No. 25 jersey retired after the conclusion of the women’s game. He scored 1,947 points in his four-year career and was a member of the 2015 RMAC Tournament championship team. Welsh later played for Siarka Tarnobrzeg in Poland’s top basketball league. Both teams face MSU Denver on Friday and Chadron State Saturday. The Mountain Lion women are tied for fifth in the Rocky Mountain Athletic Conference standings and have won four of their last five games. The men are tied for fifth and are on a seven-game home winning streak. UCCS baseball and track and field will also be at home in a busy weekend for Mountain Lion athletics. Baseball won its last three games in the home-opening weekend Feb. 1-3 will host No. 20 Central Missouri in a four-game series Feb. 8-10 at Mountain Lion Park. The nationally-ranked track and field teams will be at home for the final time this season for the Colorado Running Company Mountain Lion Open Feb. 8-9 at Mountain Lion Fieldhouse.